Writing a research article, penning a fiction or creating an office report? The first option that we think of is Microsoft Office Word Document. It has been the primary choice for document creation since ages. From experts requiring it for business purpose to kids using it to prepare school projects or for any personal purpose, MS Office Word is just so common that can help you to create letters, contracts, resumes, notes, ads, articles and so on. Some of these files that you create with Word can be extremely important and losing them can be really frustrating. You should try the first few steps to recover the documents like referring to the Microsoft troubleshoot section, or seek help from other online resources. However, if you are still unable to recover or repair the desired Word file, you can then download one of the word document recovery tools that can most certainly help you out of the situation. We have created a list of the bets word document recovery tools, so you can make your choice from the same. S2 Recovery Tool comes with buttons that allows you to conveniently call for the recommended methods of word file recovery by Microsoft, along with helping you with 5 more individual methods. 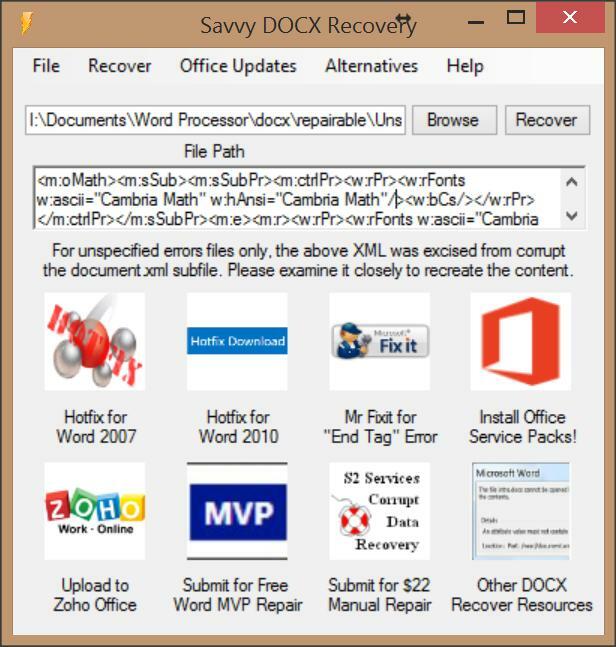 These 5 new methods help recover and open damaged MS Word files of the old doc version, as well as the new docx version. Not just that, by downloading the S2 Recovery Tool you also get additional links from where you can access two sets of known free software that helps recover Word files. In addition, you get an affiliate commercial solution and also feature its original version of recovery tool (previous version) that is compatible with any Windows platform. The tools offer more with preloaded search interface that helps you to look for temporary, lost or removed versions of damaged files. The developers of S2 Recovery Tools plan to add instructions by Microsoft that can help recover damaged MS Word files that will also open. An easy to use word recovery tool and one of the most efficient in its category, Stellar Phoenix Word Repair helps recover corrupt Microsoft Word files. Using this tool you can get back all the original texts, fonts, hyperlinks, images and headers or footers. Simple Repair, Raw Recovery and Advance Repair are the three repair modes offered by the tool. The repair mode is a great feature that assists you with repairing the online images and videos that are added in the MS Word document. Stellar Phoenix Word Repair comes with a demo version that offers preview of the Word documents that can be recovered. However, you will have to buy the product if you want to recover files. If you have forgotten to back up the Word files on your computer or on any external storage and have now lost the important documents or have been damaged, Kernel for Word can be your savior. It effectively repairs all the content in the damaged files such as, the text, images, hyperlinks, formatting, etc. The repair is performed in such a way so that the layout of the original file remains intact. Apart from supporting a wide range of word document formats like, .doc, .docx, .dotm, .dotx, .dot and .docm, it is also compatible with large sized Word files or that has long file names. Kernel for Word comes with an excellent user-interface and if you are using this under the trial period the repaired Word files will come with a stamp at the end of each paragraph that says DEMO. However, the best part is that the demo version is available with no period or no limits on the installation. Claiming to be the world’s best MS Office Word recovery and repair tool, DataNumen Word Repair also assures that no other tool can compete with it for recovering data; else the client gets a full refund. It is a powerful tool that uses advanced techniques to recover your word files that helps lessen the loss in file damage as far as possible. This amazing tool works with almost all the Microsoft Office Word documents such as, 6.0, 95, 97, 2000, XP, 2003, 2007, 2010 and 2013. It also supports both .doc and .docx formats. With the help of this tool you can recover all of the content in the original format that includes, text, images and formatting. During the process, it also recovers hyperlinks, bulleted points or numbered points and tables. What’s good about this DataNumen is that it even recovers documents that you were unable to save before the temporary files crashed. You can run a batch recovery on a bundle of files at the same time. Additionally, this recovery tool can also repair Word documents from damaged media storage devices such as, CD-ROMS, Zip disks, etc. The user-friendly interface of this tool supports assimilation with Windows Explorer and also features the drag-and-drop option. Remo Repair Word is one of the most popular and widely used Word recovery tool that not only helps repair damaged or corrupted MS Office Word documents, but also helps recover text, font size, margins, size, color and hyperlinks. You can download the demo file to evaluate its performance and you will soon find that it is quite similar to the full version. You can also preview the repaired file with the demo version. With the help of this tool while it fixes the damaged MS Word files after running a scan on it, it also saves the text or any other Word attributes in a perfect Word document. It is compatible with both the file formats like, .doc and .docx hence; it can fix files with these extensions and also use it to repair MS Word file s with these extensions. Remo Repair Word helps fix your corrupted MS Word files with any of the errors like, unusual system shutdown while working on a Document, Word application failure or unable to save docx file with different error messages. It has a user-friendly interface that guides you with the steps. It repairs DOC files written on Microsoft Office 2000, 2003, 2007 and 2010. DocRepair is the first professional recovery tool that helps recover and repair damages Word 2007 files with the .doc and .dcox formats. It can restore and recover damaged, unopened and corrupted Word documents. This pioneer tool helps resolve problems like “The document name or file path is not valid”. What’s stroking about this tool is that it recovers even those MS Word files that have couldn’t be opened till now, and eventually helps open them. it also fixes issues like Word document hanging when the file is opened. DocRepair also rescues damaged Word files from bad sectors, corrupted disk or media crash. You can easily install the software and remove if required. It is compatible with Microsoft® Word 6.0, Word 95, 97, 2000, XP, 2003, 2007 and Word 2010 for Windows, Word for Mac. Magic Word Recovery is versatile tool that not only rescues an array of MS Word document formats and OpenOffice, but also recovers RTF files from normal, formatted or corrupted storage media. Since its engine is shared with Magic Partition Recovery which is a subsidiary of the tool and a front runner as the data recovery suite. This feature assuredly helps you to get your lost word files back from even the formatted volumes, unreachable hard drives, hard to read memory cards and deleted partitions. It comes with two modes: Comprehensive analysis mode that reads the complete disk surface to find out the documents depending on the characteristic signatures while the Content-aware analysis enables recovering documents from damaged USB drives and memory cards. Magic Word Recovery guarantees 100% recovery of documents that are listed in the list of recoverable files. The tool runs a final quality check just before inserting a document to the recoverable files list. It makes sure that the discovered document by either of the modes is complete, functioning and not damaged. If you have accidentally deleted or damaged your Microsoft Office documents, Easy Office Recovery can help you get your files back. Not just Word documents, but the tool also looks up for almost all Office products that include Excel, Outlook and PowerPoint. It has an extremely straightforward interface that’s equally user-friendly. Using this tool you can look for all the lost documents in your hard drive and make a note whenever you find a file in an easy to read format. Under any emergency, it assures you to recover the lost files whether they have been erased or damaged. It runs a scan through all the drives and any portable media device for the lost files and once traced it lists them all even though not with the original name. Easy Office Recovery also allows you to preview the document through the pane that enables easier viewing that can be used even when it’s looking for additional lost document. It allows you to recover files in just one plain click. RS Word Recovery helps recover erased Microsoft Word Documents along with other formats like, Open Office and Adobe PDF. It comes with two different recovery modes viz. Quick and Responsive. This helps restore deleted document files quickly or run a complete comprehensive check of the entire disk surface. It has incomparable compatibility and supports a wide variety of storage media and file systems. Using the Content Aware Analysis, the tool reads the complete disk surface, so that it can identify the source of the file by searching for the characteristic signature. While it works with all type of storage media, it can also recover documents from USB flash drives, all kinds of memory cards, magnet and solid state discs successfully. RS Word Recovery works with both 32 and 64 bit Windows versions and can also rescue Word documents from formatted, FAT & NTFS partitions and repartitioned devices. Using the Advanced recovery mode the entire content is read in one long stretch of operation, lessening the odds of the device crash. The entire process may sound complicated, but the tool ensures that you can perform all the actions smoothly by guiding you with a step-by-step wizard explaining the entire procedure. You can even see the content of the erased documents on a full sized viewer along with all the formatting and the images. It can effectively recover doc files stored in all MS Word versions such as, MS Word (DOC, DOCX), Adobe Acrobat (PDF) and OpenOffice (ODT). If you are looking for a powerful tool that can help you to recover MS Word and other document formats like, OpenOffice as well from damaged, repartitioned, formatted and unapproachable devices, Hetman Word Recovery can easily be one of your best choices. It comes with a special Safe Recovery Mode that helps you to retrieve doc files from a severely corrupt or physically ambiguous hard drive. Hetman Word Recovery works with all MS Word and Open Office document formats and can rescue DOC, ODT and DOCX files. If you find yourself lost in the process, the tool guides you through with its step-by-step wizard that makes things easier for you. It offers a 100% assurance of success with recovery and hence, all the files that is visible in the recoverable files list is guaranteed to be recovered successfully to a normal document that can be used all over again. It ensures that there are no junk entries in the list and follows a totally safe process with the extra safe mode for physically ambiguous devices. OfficeFIX is a file recovery tool that helps you to recover corrupted MS Office Word doc files, all versions of MS Excel and MS Access. It includes Office 2003 and all other versions of office that includes 2007 as well. You can consider a file corrupt when it displays an error while opening it. All those Word, Excel, Outlook and Access files that are not working fine any more or not opening can be fixed by this tool. OfficeFIX takes out all the data from the corrupt files and creates a fresh file that is completely free of errors. Offered by the Word Recover Kit, Microsoft Word Recovery tool perfectly utilizes the skills and performance of the Kit service. The Microsoft Word Recovery tools help open any rendition of MS Word documents and reconstruct their structure to formation to repair the damage. You can get to know how to recover the corrupted Word file 2007 through the Recovery Kit website by downloading the text recovery solution for MS Word 2007. Once you have downloaded the software now simply follow the step-by-step instructions to successfully recover the 2007 Word file. Even if your computer is slow it disintegrates very large files without losing any of its productivity and transforms the output data into clean information. It helps open MS Word doc files for scrutiny irrespective of their input criteria, such as, Word file version, size and other related aspects that may affect the framework of the DOT, RTF and DOC, and other formats that are supported. This Kit also offers recovery of damaged text of Word 2007 quite intelligently. You will glade to know that, I repaired my corrupted word file by Stellar Phoenix Word Repair software.